Marc Jacobs Beauty Fineliner Ultra-Skinny Gel Eye Crayon Eyeliner in Blacquer & (Big)Eyes! Marc Jacobs Beauty Fineliner Ultra-Skinny Gel Eye Crayon Eyeliner in (Big)Eyes! 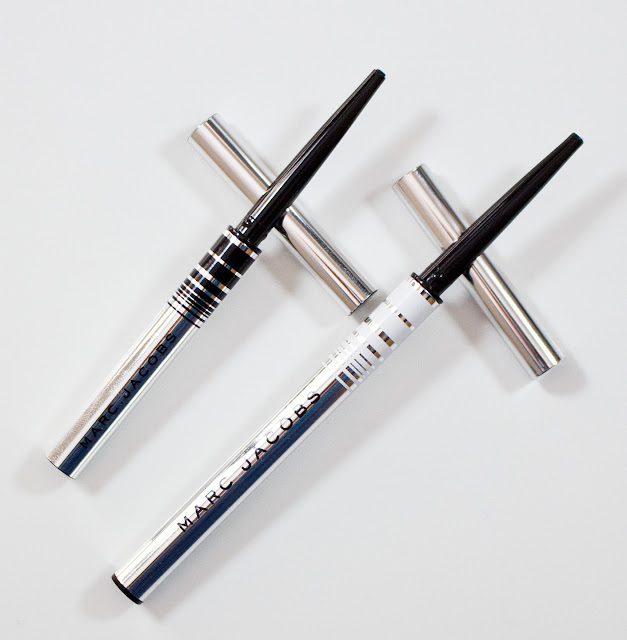 Marc Jacobs Beauty Fineliner Ultra-Skinny Gel Eye Crayon Eyeliner in Blacquer & (Big)Eyes! Box art. Marc Jacobs Beauty Fineliner Ultra-Skinny Gel Eye Crayon Eyeliner in (Big)Eyes! & Blacquer. Box art. Trimethylsiloxysilicate, Methyl Trimethicone, Acrylates/Stearyl Acrylate/Dimethicone Methacrylate Copolymer, Candelilla Cera/Euphorbia Cerifera (Candelilla) Wax/Cire De Candelilla, Polyethylene, Synthetic Fluorphlogopite, Aluminum Hydroxide, Tocopherol, Hydrogen Dimethicone. 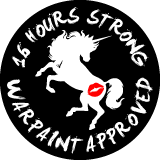 May Contain (+/-): Titanium Dioxide (CI 77891), Iron Oxides (CI 77499, CI 77491, CI 77491), Black 2 (CI 77266), Ultramarines (CI 77007). These two shades have a smooth gel based formula that sets after 30 minutes on the skin. 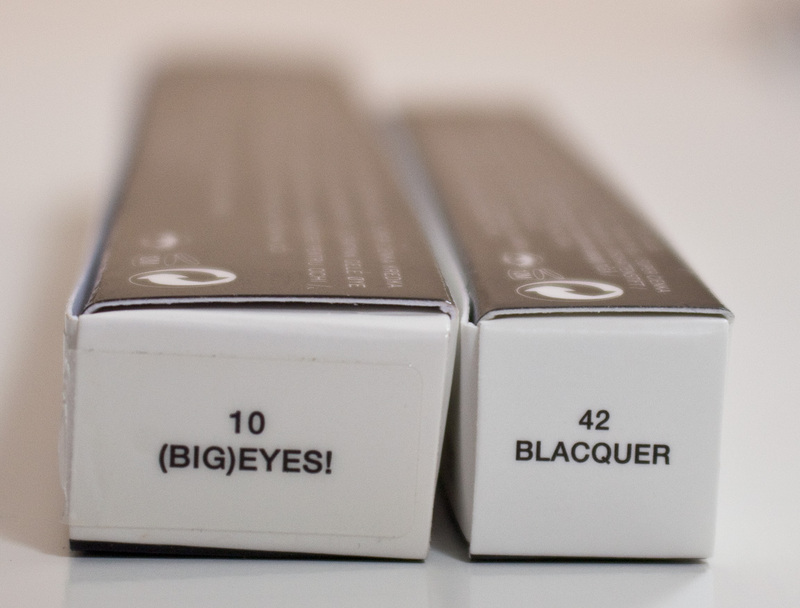 In the waterline, Blacquer lasts longer than (Big)Eyes! and is also easier to get the black shade fully opaque. (Big)Eyes! does build up to a fully opaque white after 2+ passes but it also helps to wait for each pass over the waterline to set first. 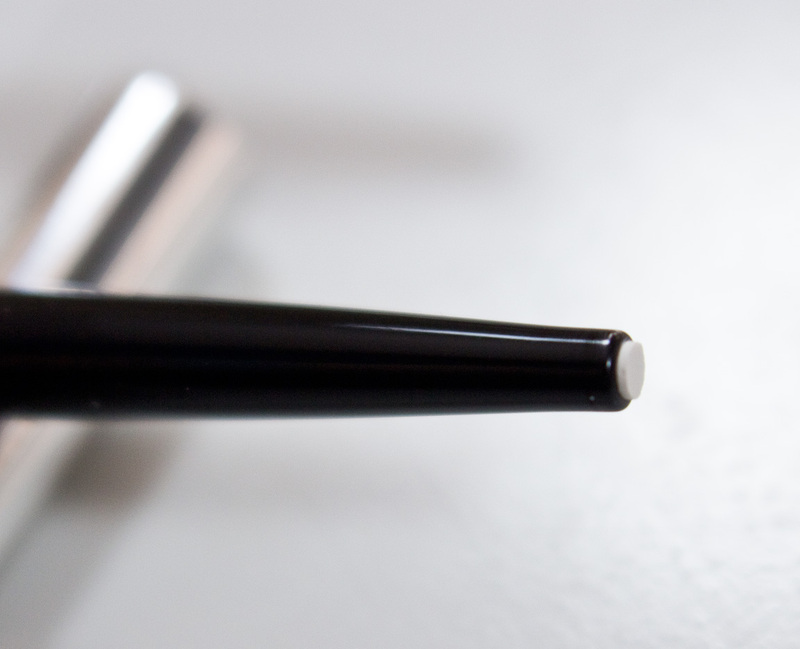 Blacquer is a true black with a satin finish. (Big)Eyes! is a true white with a matte finish. Wear: Both I get over 16 hours wear on bare skin/eyelid area. On the inner rim, Blacquer fades after 6-7 hours with my chemistry and with (Big)Eyes! fading in 4-5 hours. Packaging: This fine twist-up pencil that can not be twisted down to prevent the product from drying out. Daylight & Flash swatches: Marc Jacobs Beauty Fineliner Ultra-Skinny Gel Eye Crayon Eyeliner in Blacquer & (Big)Eyes! Stroked once thick and thin and blocked out. I do like these but you're not getting a lot of product out of them for the small pencil 'lead' you get. That said the smaller size makes it easier to get a thin line for a gel pencil.